Mondetta is such a fantastic company and their selection of men's and women's athletic wear is just fabulous. Everything is of the best quality and will last for a very long time. Mondetta is one of my favorite brands for athletic apparel. Mondetta was started in Winnipeg, Manitoba and comes from the French word for WORLD and the latin suffix for Small - Small World - Mondetta. The company has grown and become very popular! Mondetta advocates global harmony in a world undivided with the simple company slogan of "A Sprit of Unification". I received a Pitch Jacket from Mondetta and I chose the USA one. This is such an amazing, luxurious jacket. It literally made me feel like I was an Olympic Athlete when I put it on! The craftsmanship behidn it is great. The Pitch Jacket is a unisex socker jacket that is made of a Polyester bonded jersey material. It has an elastic rib trimming on the sleeves and the collar. The pockets were nice and roomy and I love the embroidered Mondetta Logo as well as The other emblems decorating this jacket! This jacket was great for wearing during a walk or jog, but it was also great for just relaxing and running around town to get stuff done! So.. to the giveaway.. one winner will receive a Pitch Jacket of their choice from Mondetta! 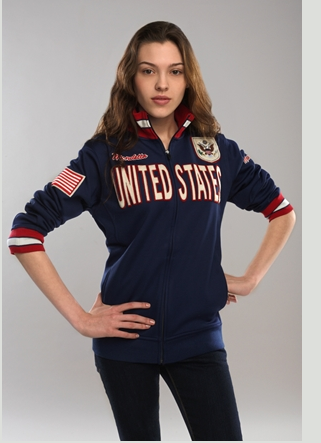 I love the Unified USA Hoodie! I love the England pitch jacket. I like the VALOUR – USA – CHARCOAL jacket. Oh other than the pitch jacket...I also love the SCOUT – BUNTING BAG!